Are you looking for the best in off campus living in the Virginia Commonwealth University area? All Pine Court Buildings are 8 years old or less and located across Cary Street from the New Engineering School; one block down Cary Street from the New Business School and one block the other way on Cary Street from the New Cary Street Gymnasium. Please see the aerial locator map on this page. 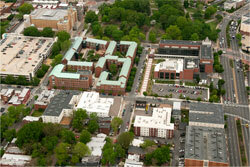 Pine Court Apartments are among the most convenient and safe housing options in the VCU area. Pine Court Apartments offers suite style designs and all bedrooms have private bathrooms.The apartments feature plenty of secure parking within the building with remote control access. The common areas feature cameras, and all buildings feature a state of the art security system, fire alarm system, sprinkler system, and smoke detection system. When it comes to VCU Apartments and VCU Housing, Pine Court Apartments is the premier choice. When you compare the price and features at Pine Court Apartments to other locations you will see we offer the most bang for the buck. One of the best features about our units is that electricity, water, sewer, internet, cable TV and more are included in the rent. Please do the math – our prices are hard to beat. Please act quickly as units are already being booked for the next school year. Please take the time to explore PineCourtApartments.com and see all Pine Court Apartments has to offer. We have never had a vacancy for a reason. All of our buildings are located right on Cary Street within 1 block of the new Engineering School, within 1 block of the new Business School and within 1 block of the new Cary Street Gymnasium. See the aerial view of our apartments at the top of this section. Get a bird's eye view on exactly where Pine Court Apartments are located.